NEW! 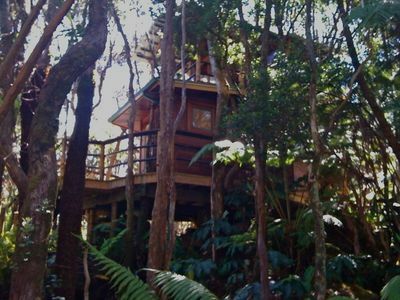 "Wainaku Hale" 1BR Hilo House w/Ocean View! 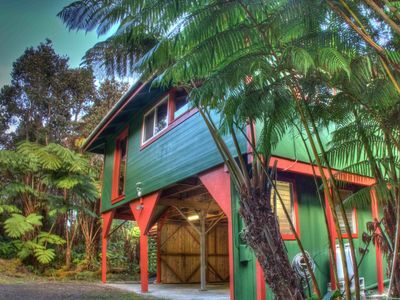 A tranquil getaway awaits you at 'Wainaku Hale,' a lovely 1-bedroom, 1-bathroom vacation rental house in beautiful Hilo, Hawaii. 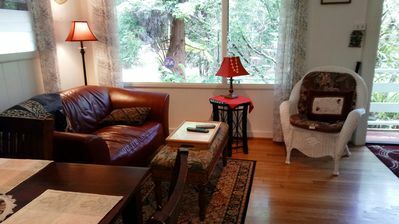 Offering accommodations for 3 adults or 2 adults with 1-2 children, a peaceful atmosphere, and a prime location near many local attractions, this charming home assures a memorable retreat! 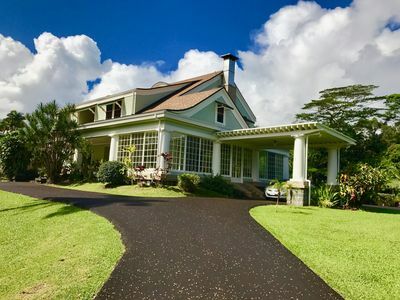 Your vacation begins the moment you arrive at the lovely 2 story home, where you'll have access to the entire first-floor level through a private entrance. 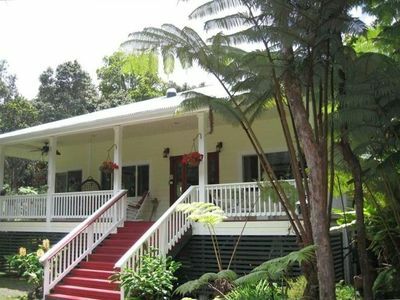 The house sits on a well-maintained plot of green grass, with vibrant plantings scattered throughout the yard. 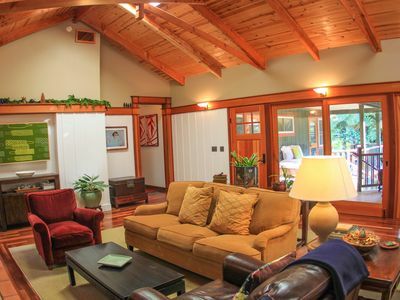 Inside, the home boasts 864 square feet of comfortable living space, featuring an open concept floor plan, perfect for spending quality time with your loved ones. Prepare your favorite meals in the well-equipped kitchenette, complete with a microwave, toaster oven, coffee maker, refrigerator, dishware, glassware, coffee mugs, silverware, cutting board, and cutlery. 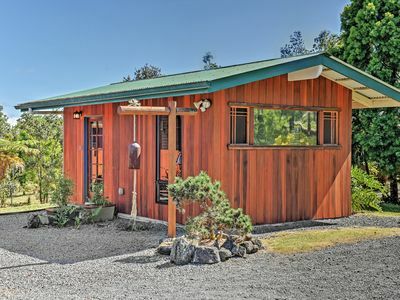 No need to pack your entire wardrobe, as this home offers laundry machines for your convenience. During your downtime, cuddle up on the plush couch that sits 3 adults and folds into a queen-sized bed in the living area while watching your favorite shows on the Samsung Smart TV. After a peaceful slumber in the comfortable queen-sized bed, you'll be ready to start your adventures for the day. 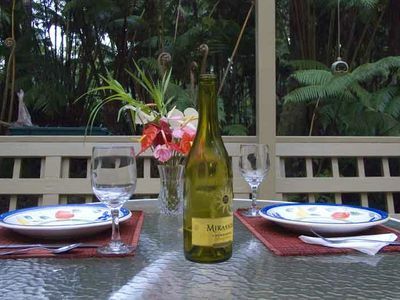 Sip your morning coffee at the dining room table with seating for 4 before heading out to enjoy swimming, shopping, surfing, and hiking, minutes from the property. 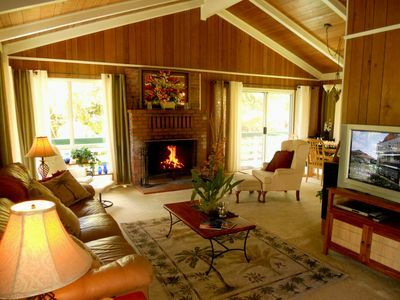 After a day full of outdoor exploration, you'll be happy to relax back at home. Curl up with a book on the couch and prepare a tasty snack in the kitchenette. For dinner, whip up your own masterpiece at the house or sample the cuisine at one of the delicious nearby restaurants! 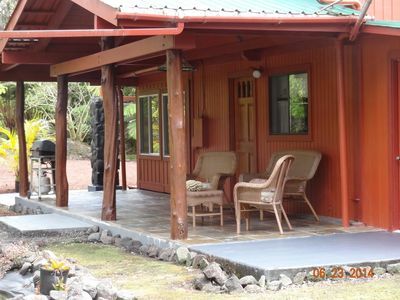 From the home, you'll be in the perfect location to easily access everything that beautiful Hilo has to offer! Enjoy a partial ocean view from the property, and drive just 5 minutes to surf the waves at the famous Honoli'i surfing beach! 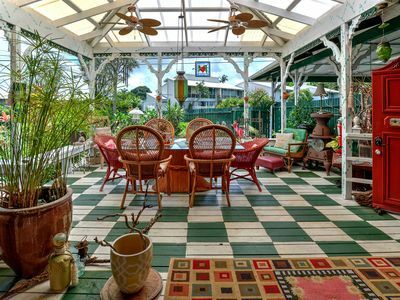 For shopping and dining opportunities, drive 5 minutes to downtown Hilo, where you'll also enjoy the Farmer's Market! 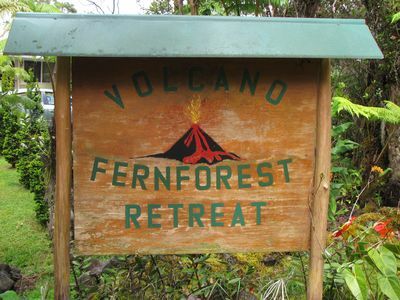 A fun day trip awaits with Kilauea Lava viewing and the Mauna Kea Observatory, just 45 minutes away! 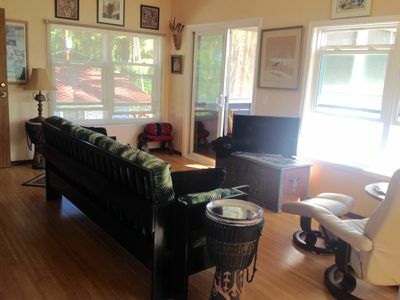 From picnics, hiking, and biking, to sight-seeing, dining, and endless water activities, you're sure to have an unforgettable getaway while staying at this ideally-located vacation rental house! 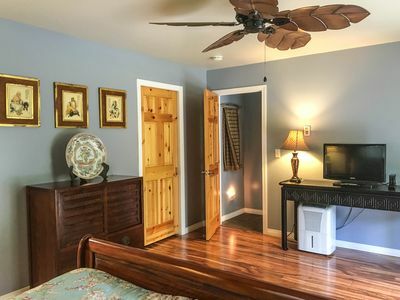 - Amenities include a well-equipped kitchenette, dining room with seating for 4, floor fan in living area and bedroom, in-unit laundry machines, carport and street parking, Samsung Smart TV, and more! 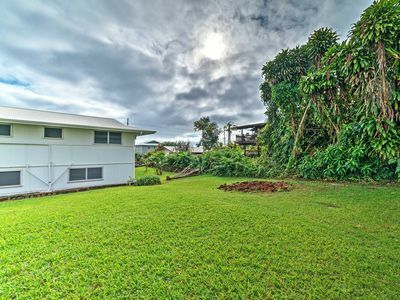 - Fantastic location - Easy access to Honoli'i surfing beach, downtown Hilo, Mauna Kea Observatory, Kilauea Lava viewings, restaurants, hiking, biking, swimming, and much more! AMAZNG SPECIAL!! 3 GUEST FOR THE PRICE OF 2!! 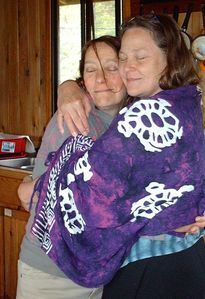 Shared Back-To-Nature R&R For 2!